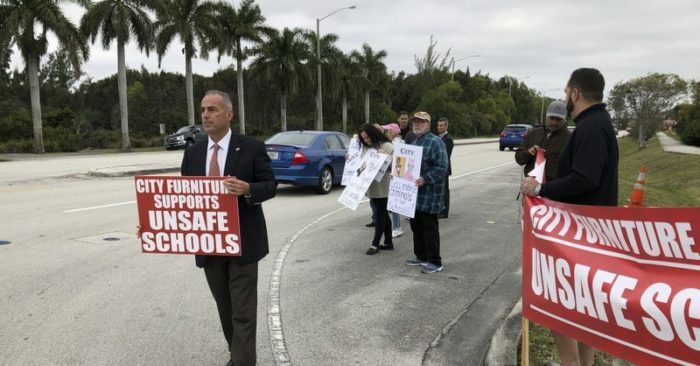 The parents of some victims of the Florida high school massacre protested Monday outside a furniture company whose CEO’s support, they say, has helped prevent the firing of the local school superintendent. Three victims’ parents from Marjory Stoneman Douglas High and about 50 supporters held up signs calling for a boycott because CEO Keith Koenig supports Broward Superintendent Robert Runcie, whom they have been unsuccessfully pushing the school board to fire. Parents Andrew Pollack, Ryan Petty and Max Schachter said Runcie’s discipline policies contributed to a former student killing 17 people at the school on Feb. 14. They say suspect Nikolas Cruz avoided significant discipline during his years in Broward schools despite a history of fighting, threats, vandalism and classroom outbursts. Koenig is the chairman of the Broward Workshop, a business group that has strongly supported Runcie, saying he has improved graduation rates and has gotten public support for better school security since being hired in 2011. “Our superintendent has failed to provide a safe school environment, but unfortunately has a lot of apologists in the business community,” said Petty, whose 14-year-old daughter Alaina died in the attack. “City Furniture does not want the kids to be safe if they support Robert Runcie,” Pollack said. His 18-year-old daughter Meadow also died. Koenig issued a statement saying he chaired a committee that raised $10 million for Stoneman Douglas victims and their families and supports the district’s efforts to make schools safer. City Furniture has 18 stores in Florida. Pollack and others have pushed new Gov. Ron DeSantis to suspend Runcie, but state law may not permit that as he is an appointed official. DeSantis recently suspended Broward’s elected sheriff, Scott Israel, for his alleged actions before and after the shooting. Israel has said he will challenge the suspension either in court or before the state Senate. Runcie has a strong majority support among Broward’s nine-member school board. He has declined to address calls for his ouster, saying he is focused on his job.